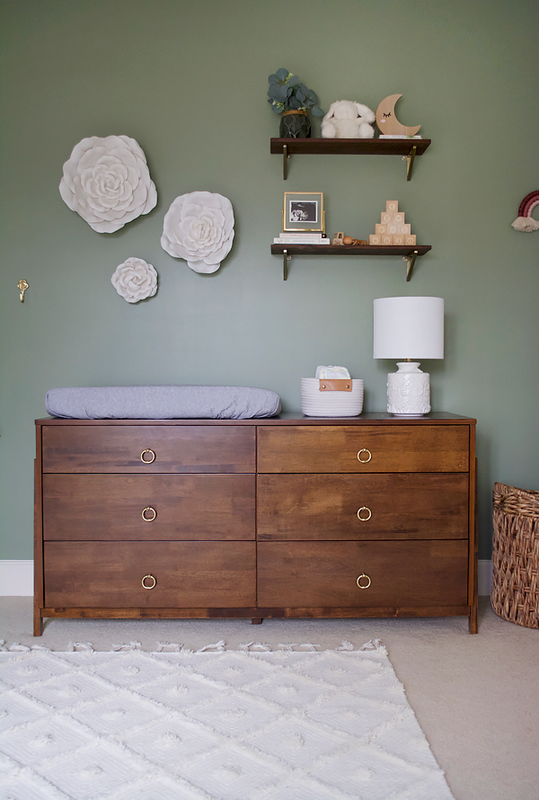 It’s a beautiful day for a room reveal don’t you think?? 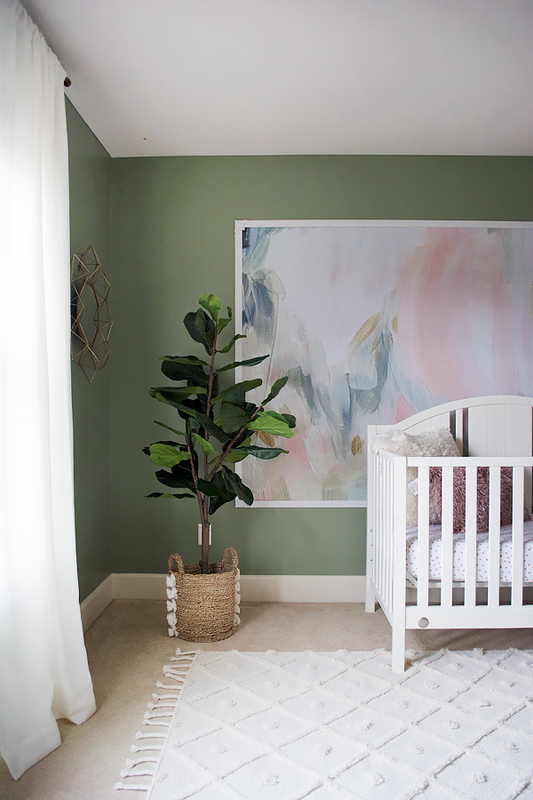 I am beyond excited to share this nursery with you guys today. 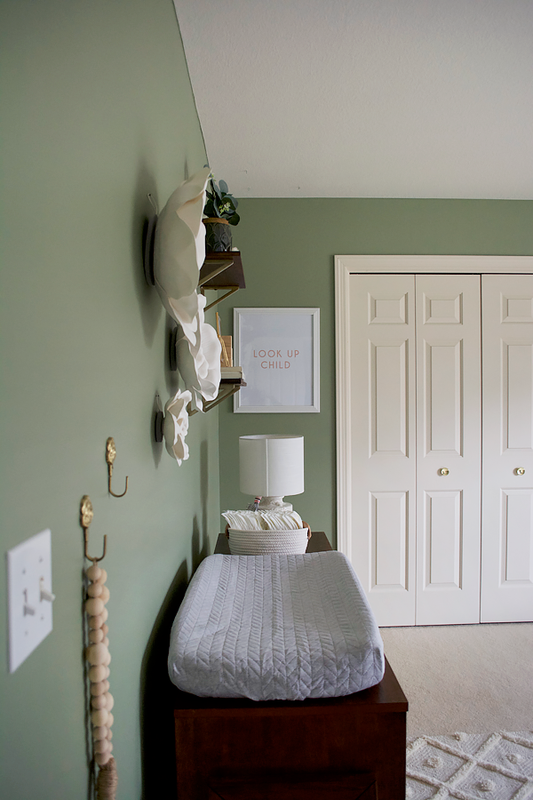 It was my first real room I completed for a client (who happens to be a good friend!) and it just made me so happy to be able to do this for her. 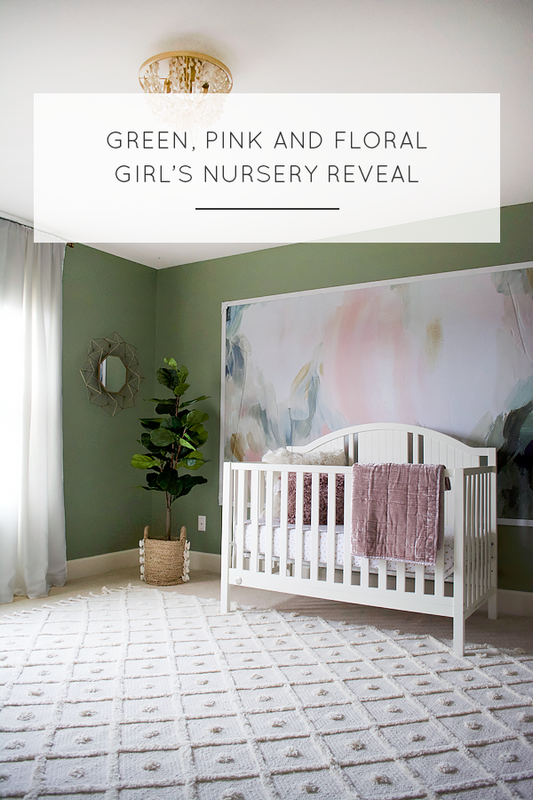 So let’s jump into this green, pink and floral girl’s nursery reveal shall we?! 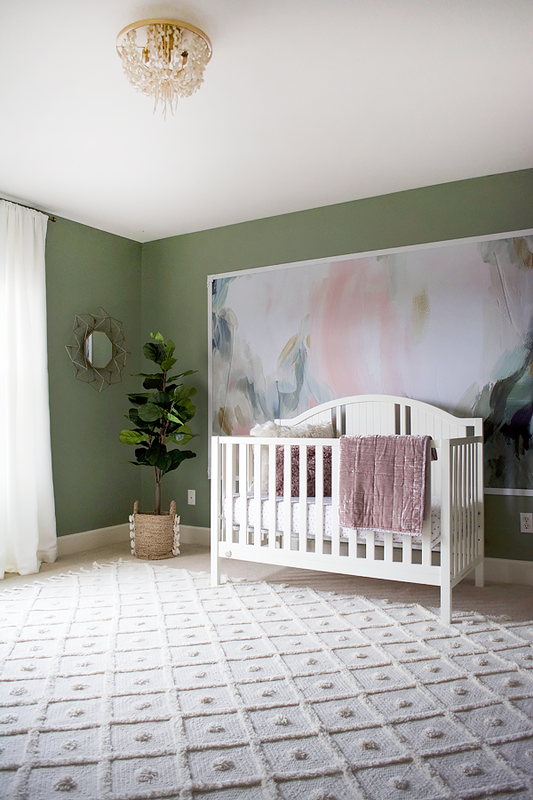 If you missed all the plans, be sure to check out that post on all the nursery inspiration and the original mood board. And before we get into more pictures, let’s take a look back on what this room used to look like. 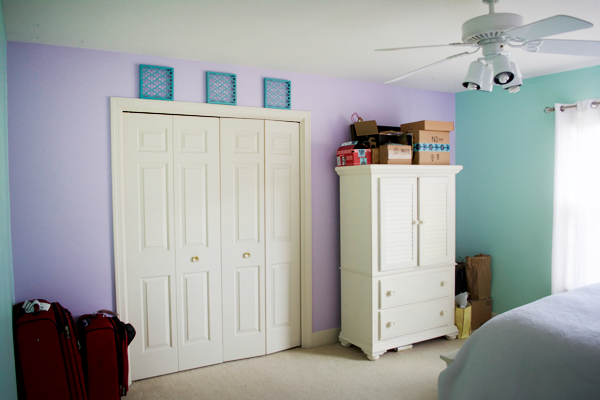 We’ve come a long way from those purple and turquoise walls! Let’s start with the piece that inspired this whole room. 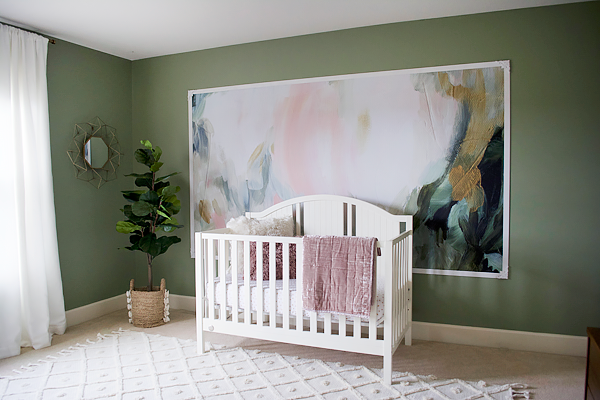 We both fell in love with this gorgeous peel ‘N stick wall mural from Minted. It’s the Mesmerize Mural and the soft, muted pinks and greens became the foundation of the entire space. The original plan wasn’t to frame it in like that, but it didn’t come in a size that was big enough for the wall. 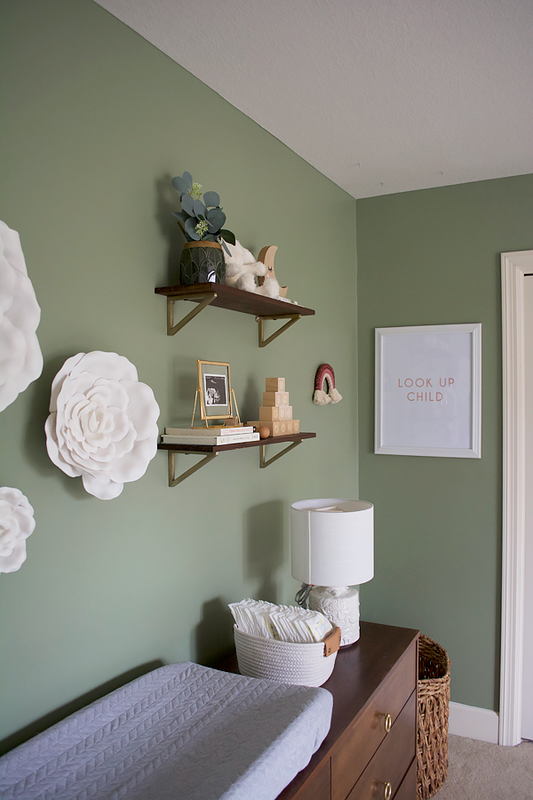 I thought it would be cool to frame it like a large piece of art and after discovering Jenna Sue’s tutorial on her DIY Framed Wall Mural, I was sold on the idea. I’ll be sharing a whole post about how we installed it and what we used to frame it in soon so be on the look out for that! I thought about hanging something on the wall above the crib, but decided to let the mural shine on it’s own. Let’s move on to the corner with the rocker. 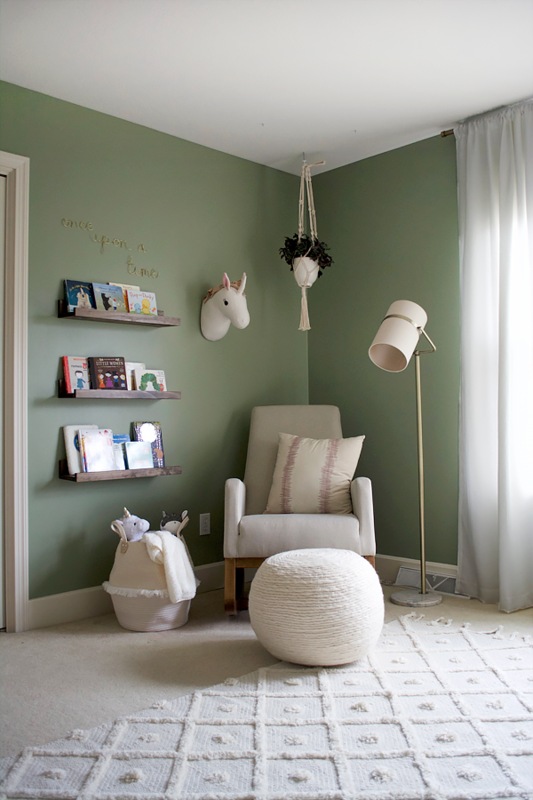 I have this same one in Hawk’s Nursery (in gray) and absolutely love it. It’s a great modern option and is super comfy too! 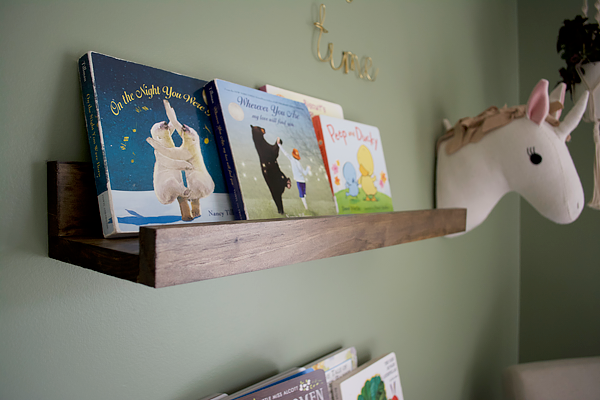 From the start, I knew I wanted to hang some shelves for books. 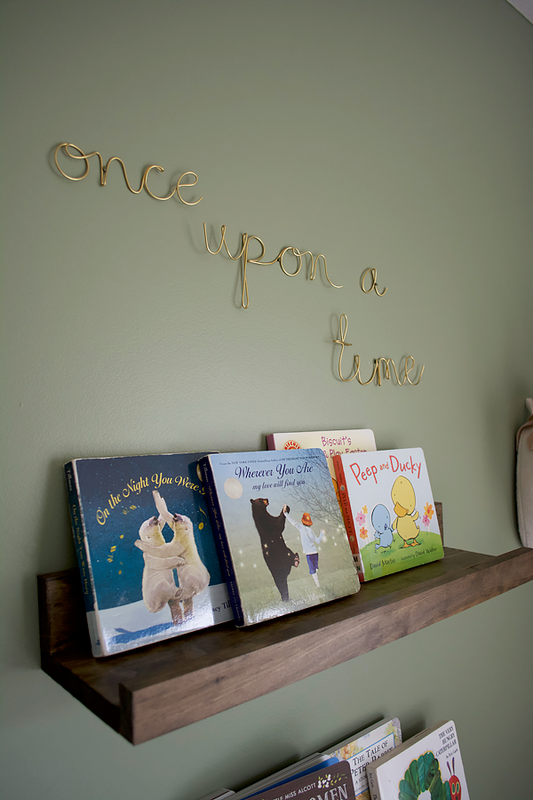 That’s the one thing we lack in Eloise’s room is book storage so I wanted to make sure Maria had somewhere to put them. Plus they double as an art display with all those cute covers. Dan built them for me and they were super easy. 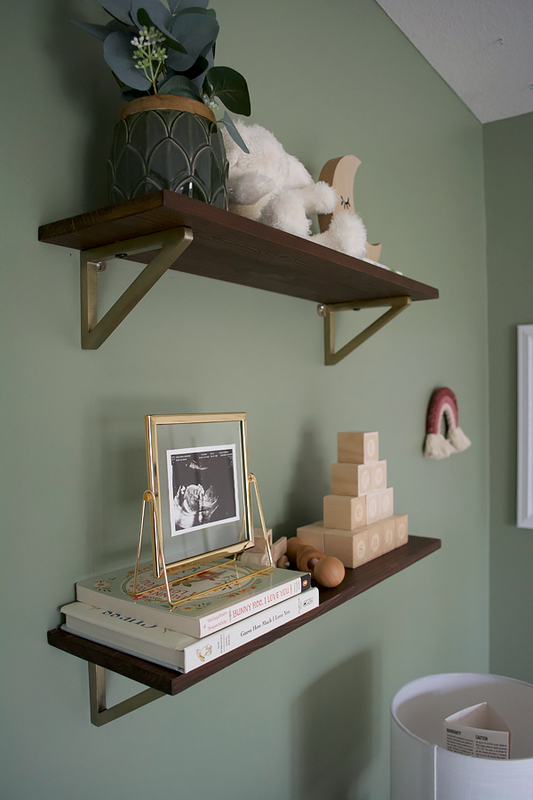 Giving them a coat of Dark Walnut stain helped tie them into the other wood elements in the room. When browsing Pinterest one day I saw a similar gold script decor and I found this one on Etsy. 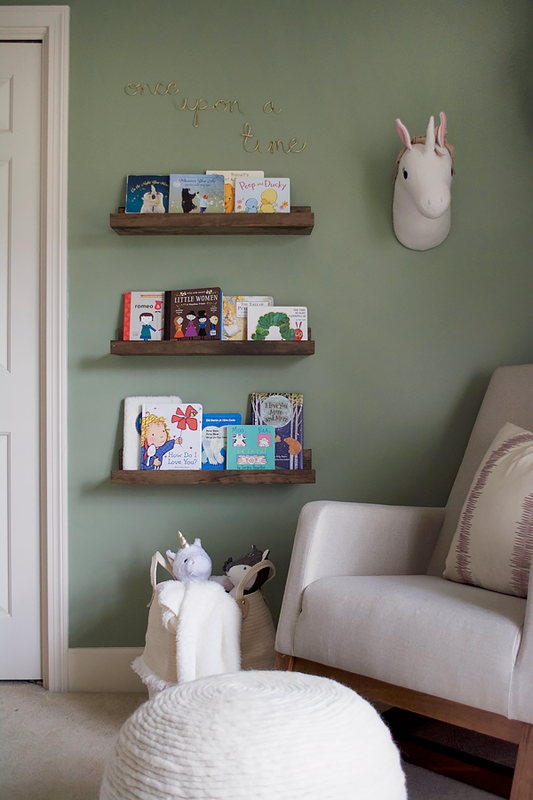 I love the subtly of it and how it helps fill the space above the shelves. This little corner makes me so happy and I wanted to make it special since I know Maria will be spending lots of time here those first few months. 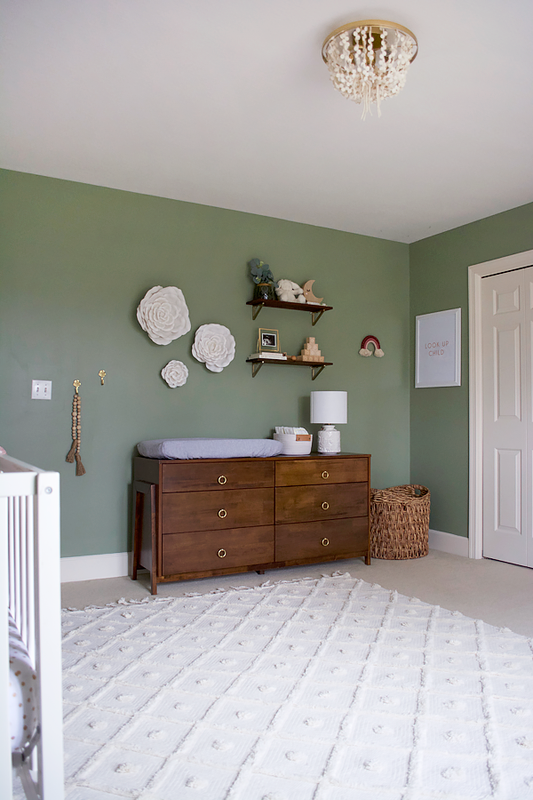 The last space of this room we need to talk about is the changing table area. 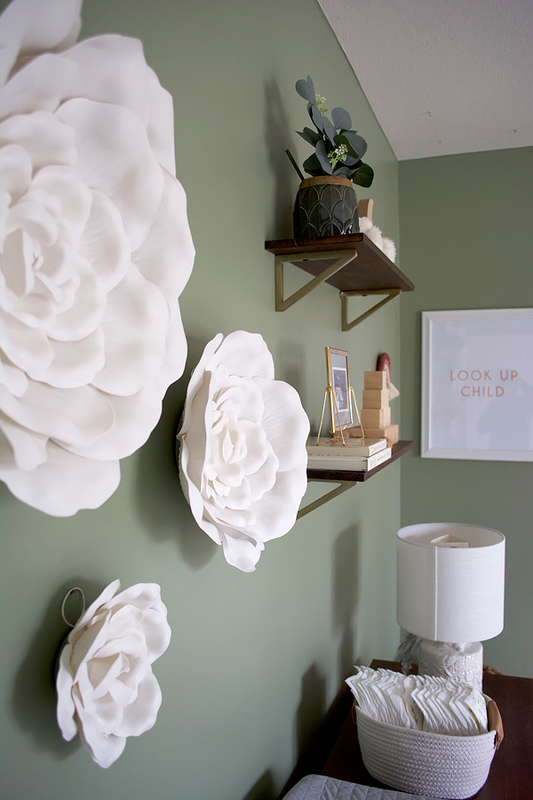 I love this wall so much because it’s where I got to incorporate some personal touches for Maria and could really personalize it for her. 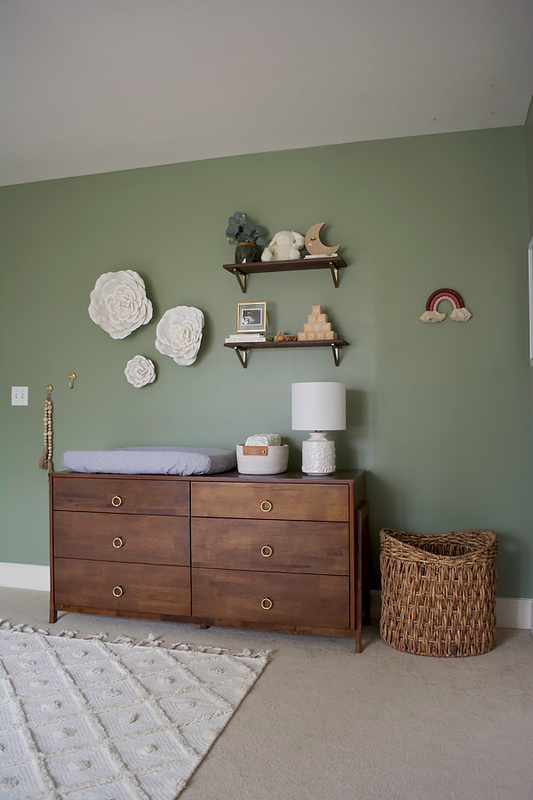 You know I love using vintage furniture in a lot of my spaces and although I kept that as an option when I was planning this nursery, we ended up finding this gorgeous dresser on Overstock. 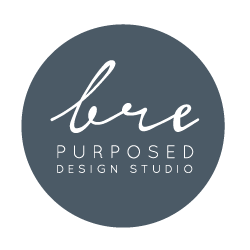 It’s modern, simple and will be something that can be used for years to come. The drawer pulls it came with were silver, so I spray painted them gold to better fit the room. 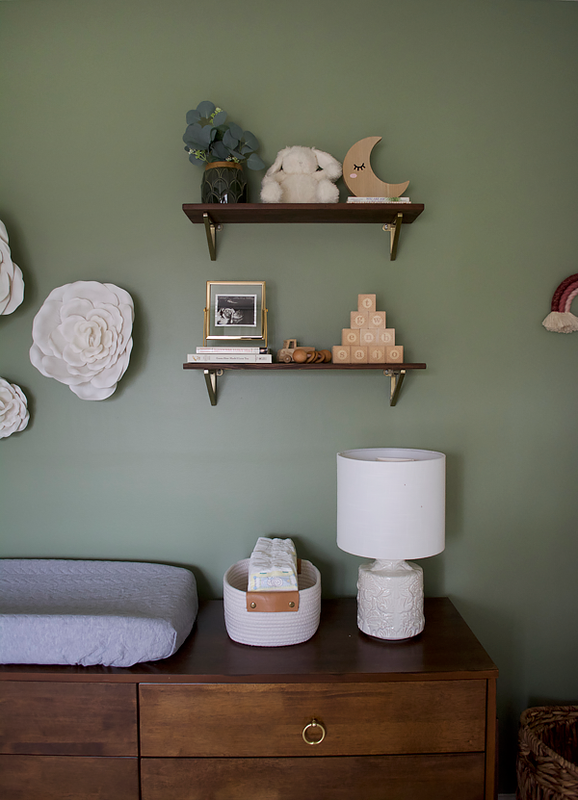 I loved styling these little shelves and adding things that have special meaning to Maria and her family. 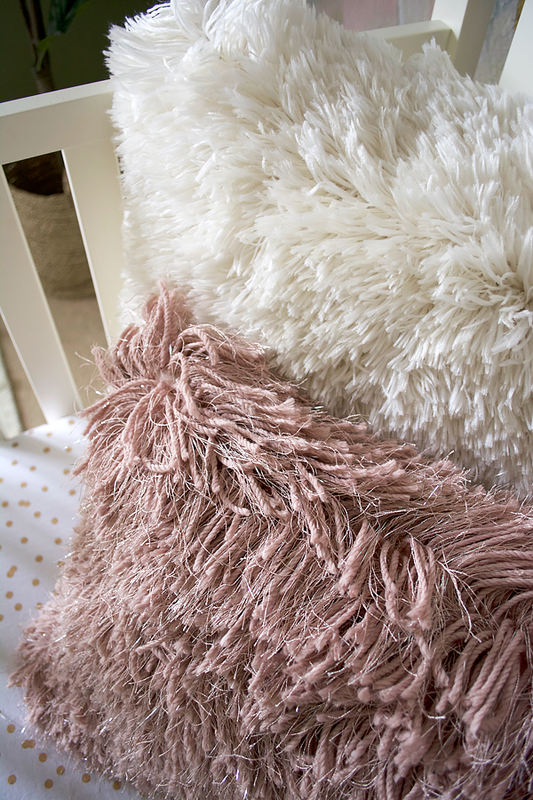 Maria saw the nursery up to a certain point but towards the end I made her stay out so I could add some special touches and make the final reveal be a surprise. It was priceless to see her reaction when she opened the door and one piece that got us both crying was the “Look Up Child” print I made for her. I know how much she loves worship music (as I do too) and when I was brainstorming what kind of print or artwork I could make to hang on that wall, Lauren Daigle’s new song Look Up Child came to mind and I thought it would be absolutely perfect. And here’s some more pictures because I took way too many and can’t help but share them! 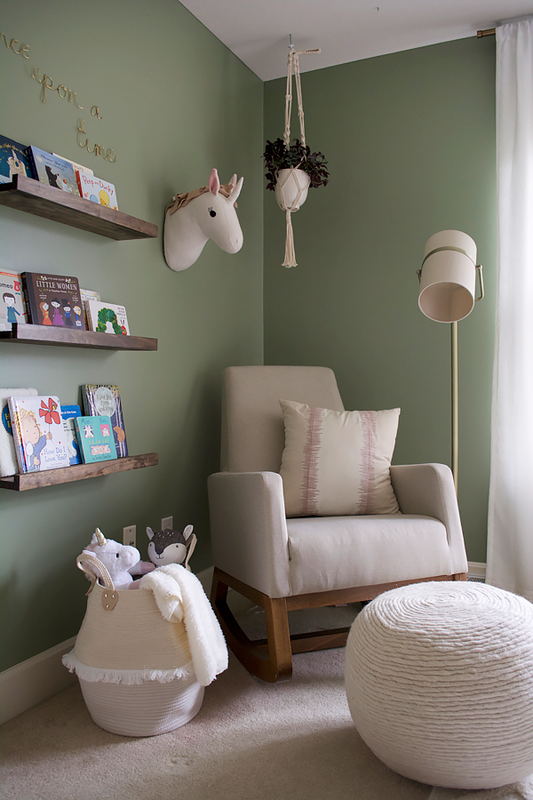 Revealing this nursery to Maria was such a special moment and a feeling I won’t ever forget. 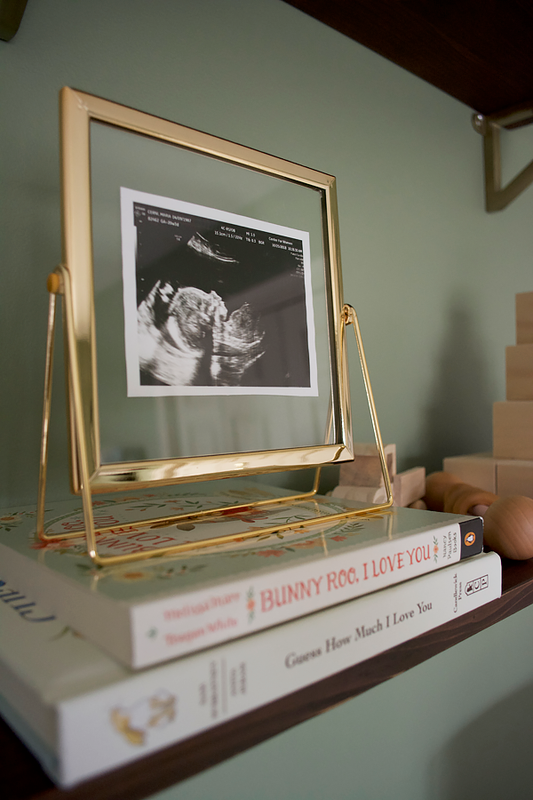 I’m so glad she allowed me to create this beautiful space for her and I can’t wait to meet her little lady next month! What a beautiful, tranquil space. I love the feel and how it just flows together. You are very talented. 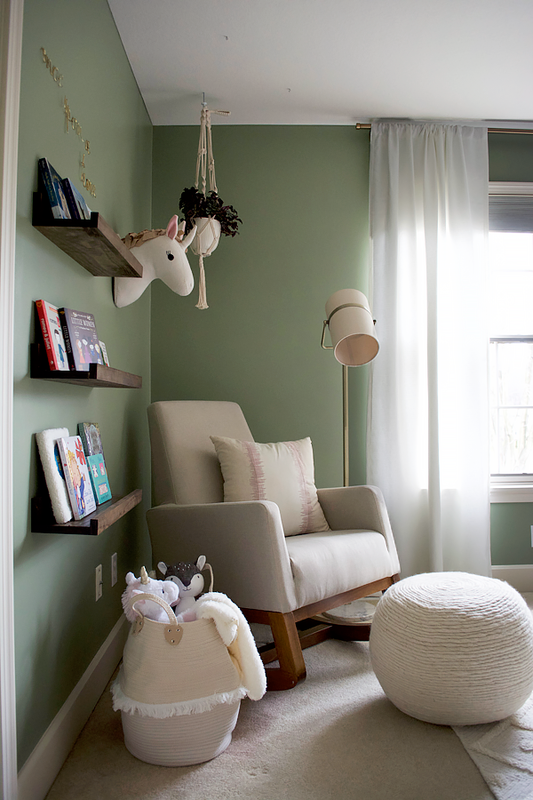 I especially love the reading nook and want to make an outdoor area for myself with the same idea. 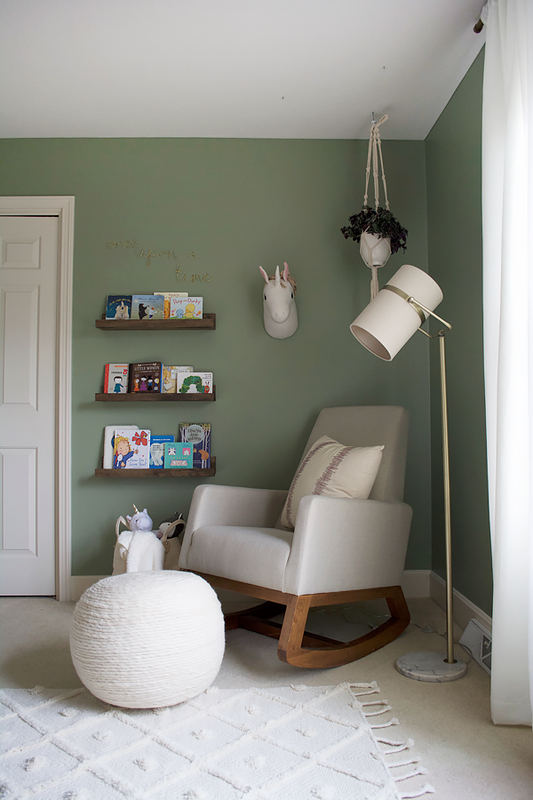 Not for a nursery, but for me, an outside sanctuary for reading, reflection, and relaxing — Mele’s Nook. 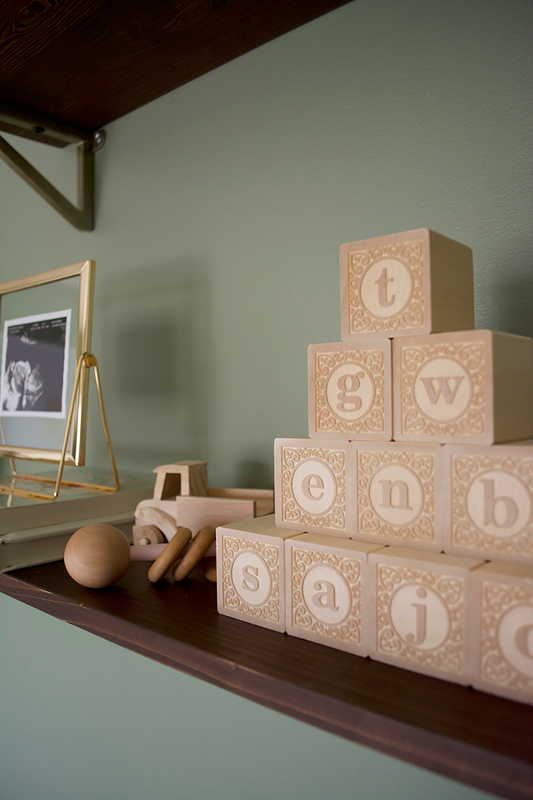 I even looked at pieces similar to two that you have used in this nursery. Thank you for sharing. Just gorgeous! I’ve been loving that framed mural since you posted it on IG and I can bet it doesn’t disappoint in person! 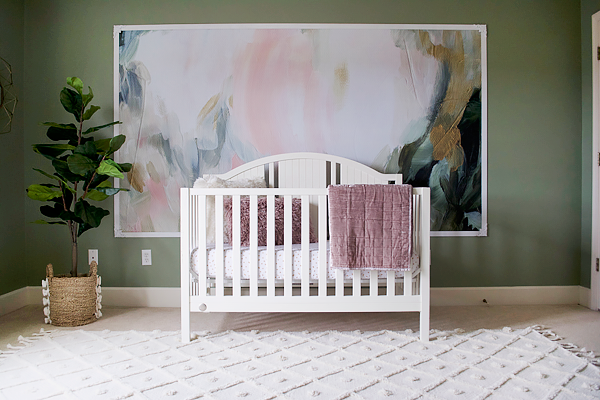 It’s a gorgeous wall of art, really, with the way you framed it out! Beautiful! Thank you so much Michelle! We both fell in love with it as soon as we saw it! 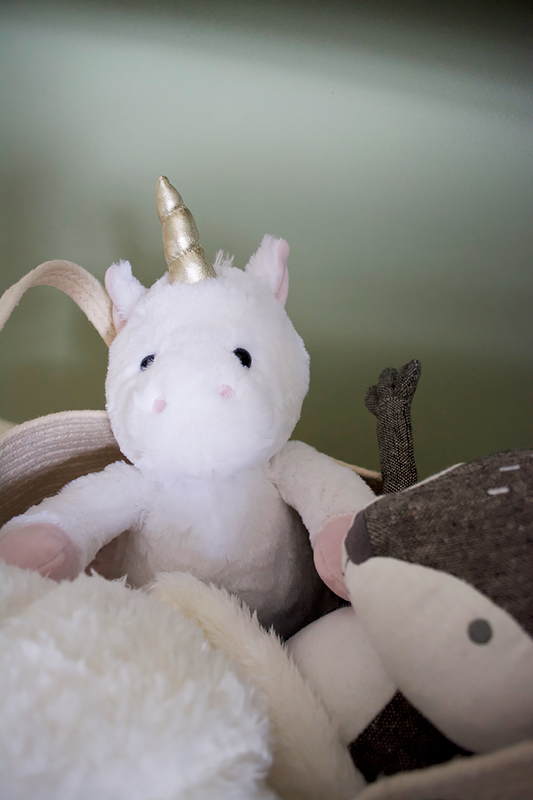 You are such an amazing decorator and your nurseries and childrens’ rooms are especially wonderful. 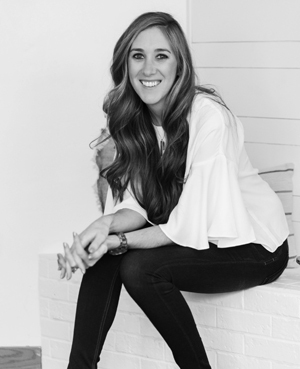 I would imagine you would have great success doing it professionally on a full-time basis. 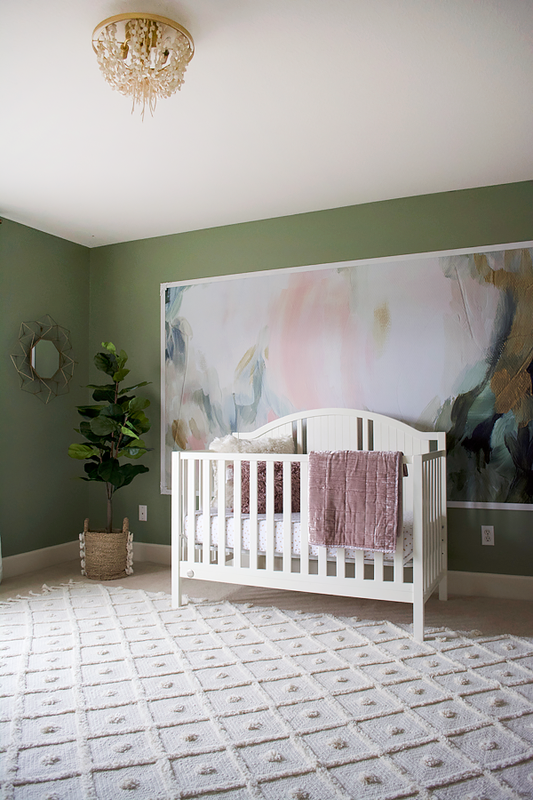 I love the framed mural also because the paint color surrounding it makes it pop even more. You are too kind, Pat! Thank you! What a beautiful space! I think I like the framed mural look more than the full wall look. So many special memories to come in this room!